Launching a new brand of camper is never easy, especially when it’s founded on new concepts and formats and the market is saturated with alternatives. But, for Chris Ahyee at Impact Tray Campers, it’s been a journey marked by pride and satisfaction at the increasing market awareness, and the first signs of success. Chris launched his unique side-fold, soft floor slide-on camper two years ago after developing the idea for himself several years earlier. The initial version (CTA Apr ’14) drew plenty of attention and began the process of market feedback, including some from this correspondent. After a lot of thought, Chris recently added a new series to the product range: the TrayMaX. 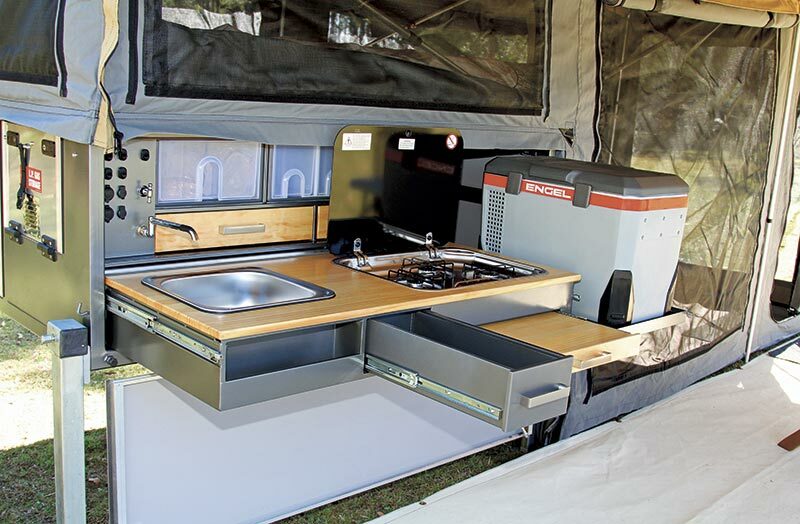 These new campers have been designed for families and those who require more storage space for equipment, with greater independence while camping. 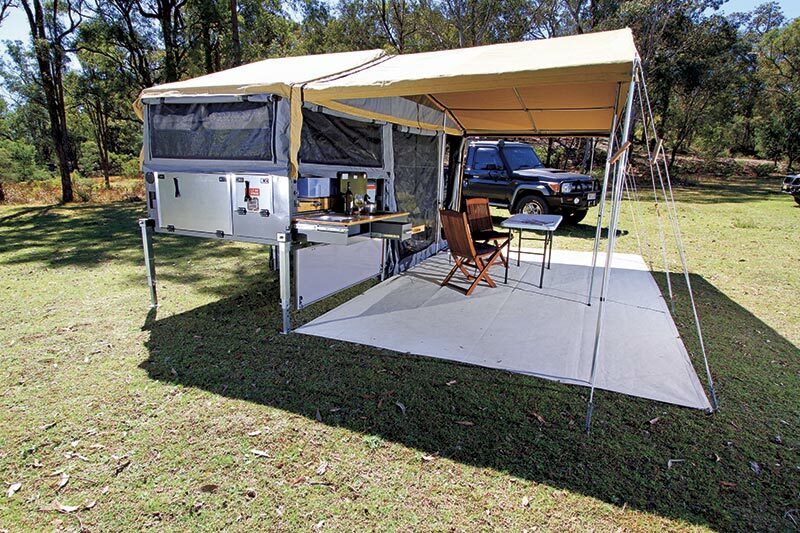 The principal difference between the TrayMaX and its predecessor is that the body of the camper unit has been enlarged by increasing the depth from 400mm to 630mm. This might not seem like much of a change, but it has resulted in a major revamping of the facilities throughout this unique slide-on. For a start, the total storage volume in the camper has gone up by 60 per cent, and that’s a big advantage when you’re taking a tribe of kids along. The biggest beneficiary of this is the kitchen. 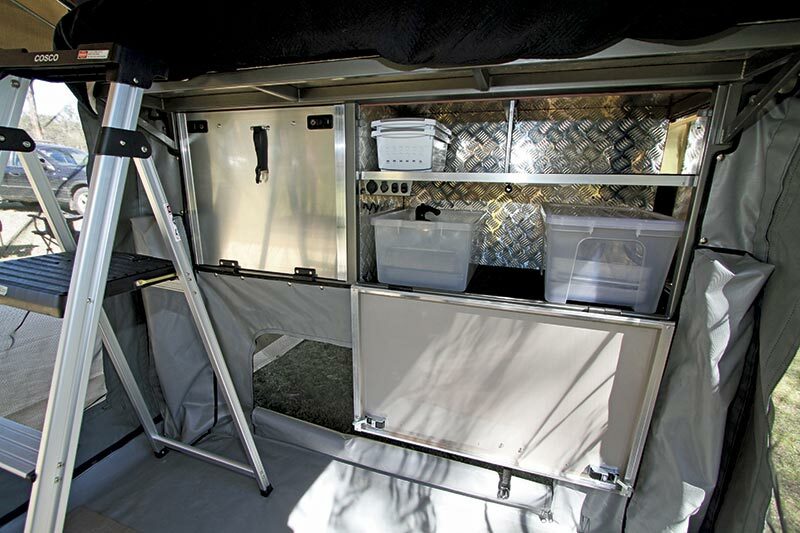 In the past, the kitchen swung out, projecting at right angles to the body of the camper, but it now slides out parallel with the side (actually the back, when mounted on the vehicle), allowing its depth to be increased by 130mm to 630mm, and providing more bench space. The kitchen bench still has the classy oiled pine top, with the three-burner Smev stove and stainless sink, with a small storage area for washing-up gear and two drawers and a pull-out work shelf underneath, all with soft-close features that also stops the drawers rattling open on the road. Above the sink are two more 500x500mm carpeted drawers, again with soft-close fittings, and four deep plastic drawers as a pantry. In terms of food storage, you can have the option of two drawer-type fridges, using one as a freezer, or one drawer fridge and a barbecue above it. If you have a larger fridge, up to 80L, it can be mounted to a slide around the corner in the main storage area. That storage area is now 600x1300x900mm plus a side shelf area, allowing for the storage of heaps of gear, either in tubs or loose. 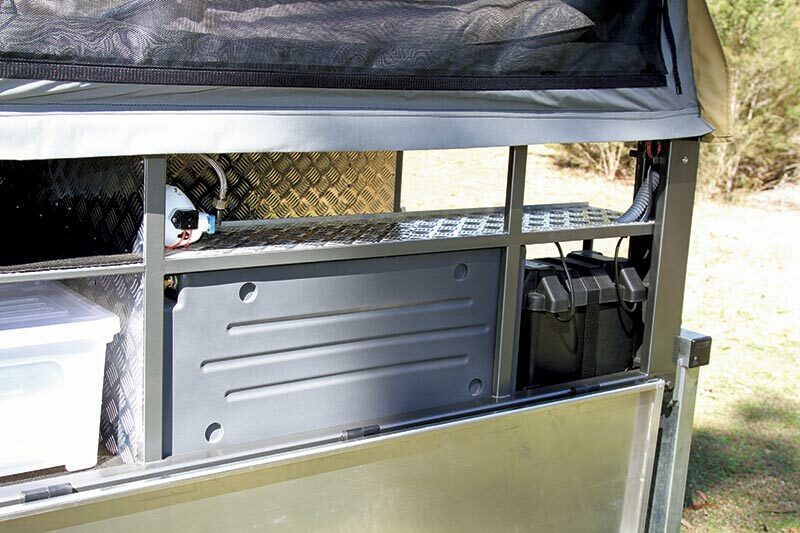 On the left of this area which, when loaded, is at the front of the camper and closest to the cab, is a 60L water tank with pump and a standard 110Ah deep-cycle battery, which can easily be changed to an AGM or other type. 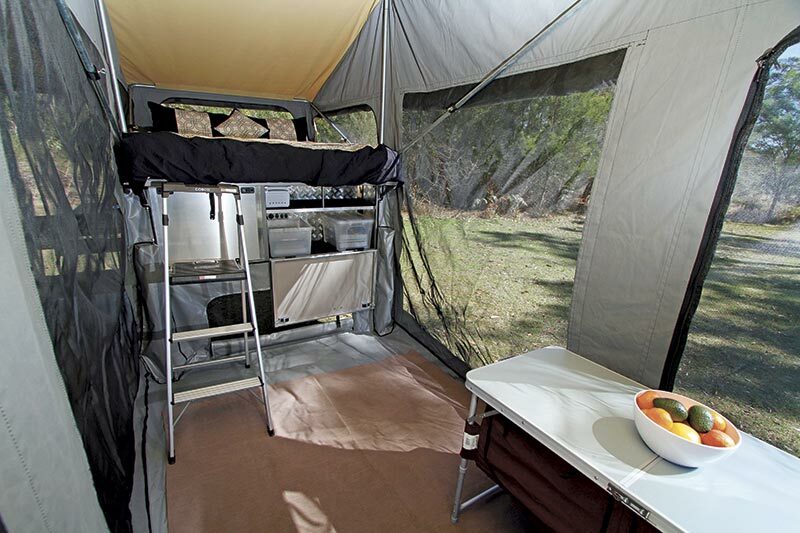 The camper comes with its full 240x4800mm awning, which can remain permanently attached, plus there are zip-on options for an awning on the opposite side, or a separate full or half room or shower tent. Coming standard is a clear end wall in front of the kitchen, which keeps the kitchen area bright while acting as a weather and windbreak. Other walls are optional and the ground matting seen here is standard. 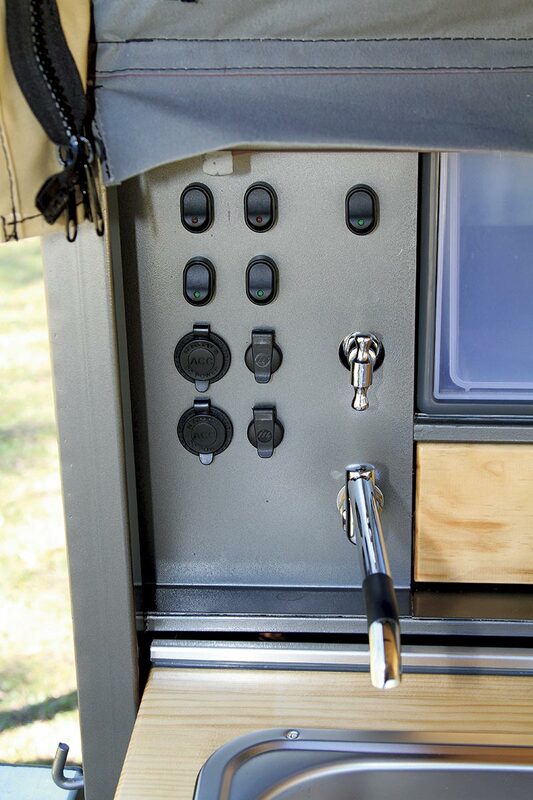 The Impact Tray Campers’ TrayMaX continues the evolution of these unique campers. As a value for money option, it isn’t too bad at all, with everything you see here in these images, other than the fridge, costing $18,700. It is simple, roomy, well put together in all respects and with a standard of finish that would do credit to a long established company. It gets our thumbs up. 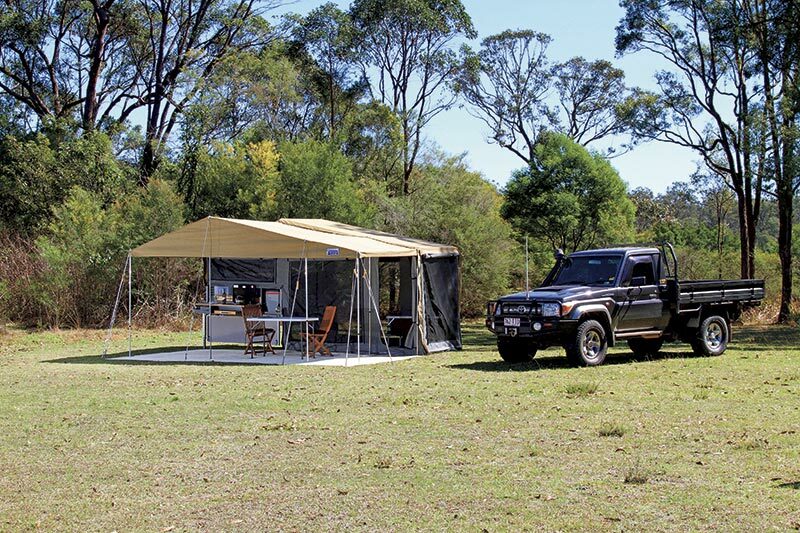 Read more Camper trailer reviews. If you don't want to miss out on all the latest news and reviews, why not subscribe to the monthly Camper Trailer Australia magazine today!